The Zoom tool (or function) in Word allows you to increase or decrease the size of an area of the page (or document) you are working on. To do this, we must access the View tab on our toolbar. Once we are on the View tab, locate the Zoom menu and its options. 1. The first one you will find is represented by a magnifying glass, relating this object to the action of getting near for a better look; or the other way around. After clicking on this Zoom option, a main control box will appear with commands to carry out this function. As you can see, there are three different pre-determined percentages: 200%, 100% and 75%. However, we can use any percentage we want. It will depend on how much of the visible area we need enlarged. this will be shown on the Preview of the control box. This preview shows how the page will look and the approximate font size. If we need to use a Zoom of 75%, we select this option. this will make more of the worksheet visible, but in a smaller font. 2. The second icon we will find is 100%, which is nothing more than having our worksheet in its normal setting. 3. The One Page option lets us view the complete worksheet. In other words, we will have a full page on our screen. 4. The Two Pages option shows two consecutive pages in the document. 5. 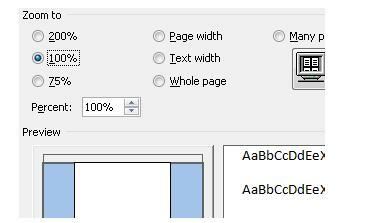 The Page Width option is applied when we need to see the whole width of the screen; the width of the pages in a document. The width of the screen matches the width of the document. Depending on our needs, we will need to get a closer look at the document or to see it from a further point of view. Many people prefer having a larger working area even if this means having a smaller font size. Others prefer not to tire their eyes and have a closer look (smaller working space) as well as larger font size.